Valentine's Day is around the corner and everybody seems to be falling in love. While Madison's father and his girlfriend, Stephanie, are acting like love-birds, her e-pal BigWheels falls in love too. Even her pug, Phin, has found a new dog grilfriend. But things aren't going well for Madison. Madison doesn't have a date for the "The Heart to Heart" school dance. And there's this secret admirer called "Orange Crush" who has been e-mailing Madison for a while. Is it her crush Hart? or Chet? or Egg? May be someone's playing a prank on her. Madison is still worrying whether to believe this orange crush guy or not. Finally Orange Crush is asking Madison to meet him at the school dance. The "The Heart to Heart" dance is coming nearer and a big surprise awaits Madison. I love Madison Finn books and this one was really kept me glued to the story until reached the end. This is by far my favorite Madison Finn book in the series. Madison is a 7th-grade girl with divorced parents. 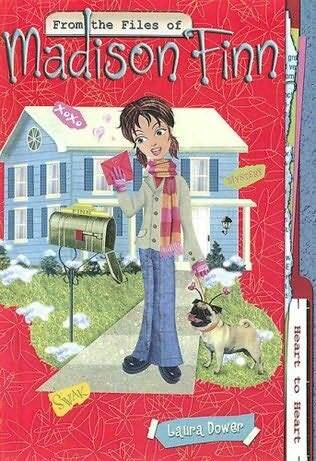 The series is about Madison's life and how she copes with her family, friends, enemies, and of course, boys. The fun thing is that Madison loves to write about her life in files on her laptop (sort of a diary). Madison's life will probably remind of your school days. This series is great for children. More Madison Finn Reviews Here!